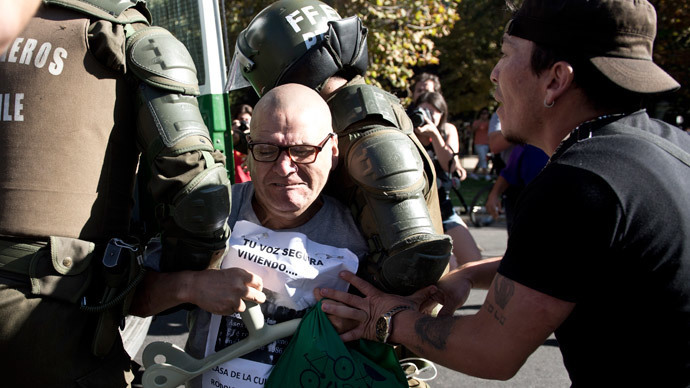 Protesters have clashed with police in the Chilean capital during a mass protest for free education. Tens of thousands of demonstrators flooded the center of Santiago, urging the government to deliver on its promises for educational reform. 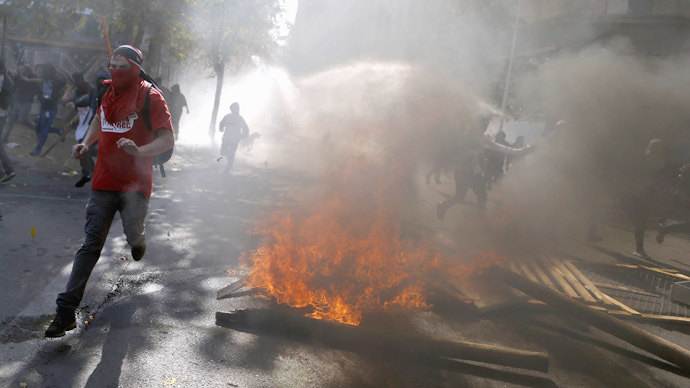 Chile’s first mass demonstration of the year, calling for educational reform, ended in clashes with police and violence. Hooded youths hijacked the peaceful protest, setting fire to a jeep and hurling Molotov cocktails at police officers, five of whom were injured. Activists also attempted to block the streets by constructing makeshift barricades. Police retaliated, using water cannon and tear gas to disperse crowds of protesters. The organizers of the event claim that over 100,000 people turned out for the march, while Santiago’s authorities estimate that around 40,000 people took to the streets. In addition, over 1,800 officers were deployed in the Chilean capital to keep order. 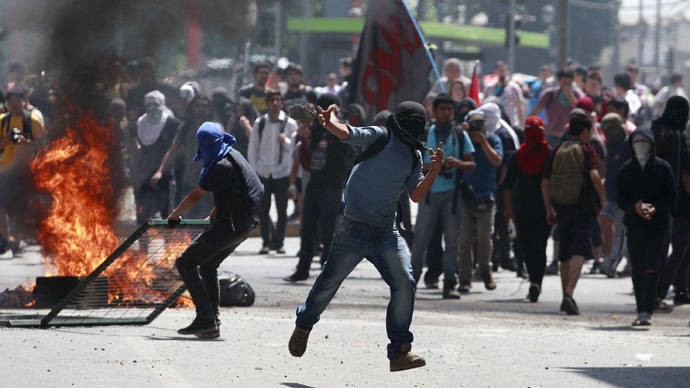 This is the first time the Chilean capital has witnessed a mass education protest since Michelle Bachelet assumed the presidency two months ago. After her election, Bachelet pledged that she would overhaul Chile’s education system, responding to the millions of people who have participated in protests since 2011. They complain of poor conditions, inadequately prepared staff and overpriced private universities. In spite of President Bachelet’s promises, the demonstrators say they are not enough and are demanding more transparency in the process of reform. “We know that the government is not going to give us any concrete answers and is not going to attack the fundamental problem of education," said Lorenza Soto, spokesperson for the Assembly of Secondary Students (ACES). 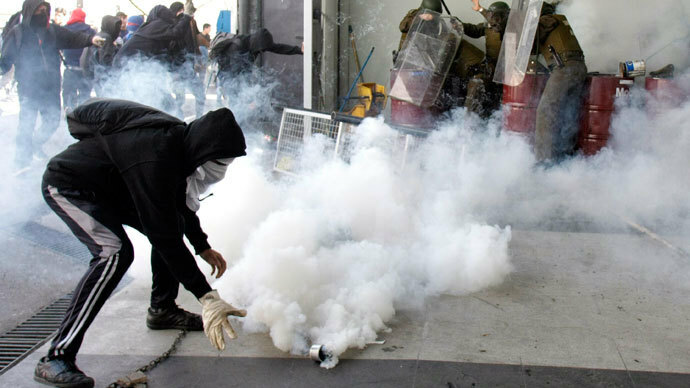 "What we've done so far is injecting more money into this same system that segregates," said Melissa Sepulveda, a student leader at Universidad de Chile. "This system generates one type of education for the rich and another for the poor." As part of her initiative to improve the situation for students and pupils across the country, Bachelet plans to fund the education overhaul with a corporate tax hike. The tax aims to raise around $8.2 billion that will contribute towards the formation of a free university system in the next six years, according to Bachelet. Under former Chilean President Sebastian Pinera, the protest movement’s clamor for educational reform was largely ignored. Chile’s higher education system remains one of the world’s most segregated and expensive, a relic of the 1973-90 military dictatorship of Gen. Augusto Pinochet.